Laura and I left the Bay Area today, staying one more time with our hosts and new friends Adam and Julia in Berkeley (thanks guys!). We did some groceries at Berkeley Bowl where we met another follower of our blog who gave us directions to the Rockridge BART stop so we could avoid the hassle of transferring trains with fully loaded bikes (thanks, nameless reader!). 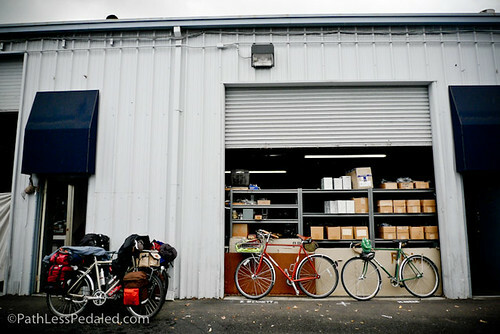 From there we made our way to Walnut Creek to stop by Rivendell Bicycle Works, a company that I have always liked and inspired my other blog, Epicurean Cyclist. 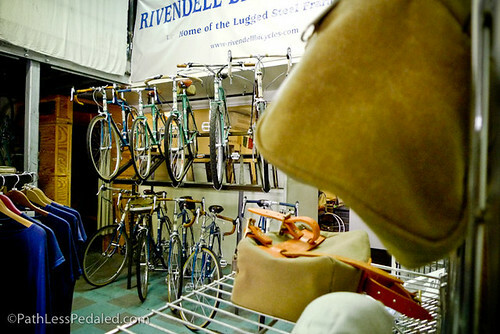 We got off the Walnut Creek stop and pedaled in the general direction and got lost in a maze of garage spaces before stumbling into Rivendell HQ. As we pulled up, as if on cue, someone with a beard and a Legolas with leaf attached to the top tube (who we got to know later as Vaughn) greeted us with a “Welcome to Rivendell”. One thing that struck me instantly, was how simple and “lived in” the place felt. It had the feeling of entering your favorite used book store or camera store. Wooden shelves, boxes with hand written labels, a pleasant sort of pleasant insulating clutter that made you feel at home. For a company whose products are often scrutinized and fetishized, the actual people and place had a more laid back, blue collar than ivory tower feel to it. 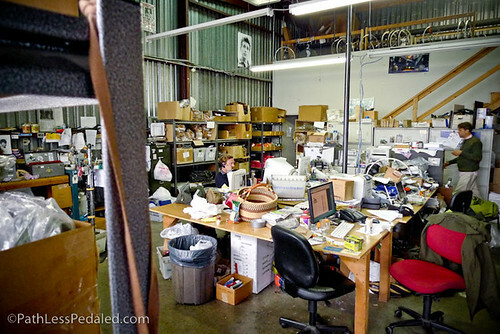 After checking out the showroom we stopped by the office to where the magic happens. It was a single open room where Jay fielded customer calls, Grant and Dave worked on the next Reader and other administrative tasks were carried out. 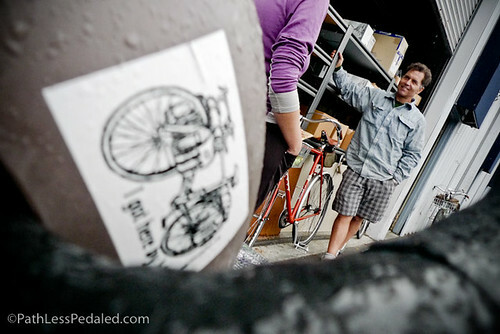 We got to talk to Grant about our tour, our bikes, photography and Etsy! As much as Grant is often characterized as a Luddite by some, he had a digital camera, knew about Etsy, and was navigating around QuarkXpress that had the forthcoming Riv Reader. I know that none of this should come as a surprise, but often people with strong personalities and ideas get transformed into caricatures of themselves. 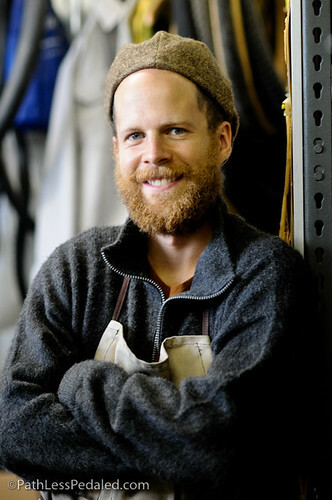 Grant, who I sometimes kiddingly refer to as “the Great GP” on EC, is but a mere mortal who has thought deeply and felt deeply about bicycles and has created a business out of it. For me, it was a treat to meet the man you coined the term S24O. 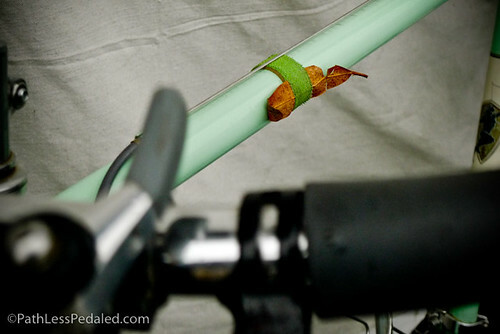 I remember reading the article in an issue of Adventure Cycling and making up my mind to do one S24O per month. Laura and I lived in Los Angeles, so it was serious work to find good S24O opportunities. However, by doing one a month, it planted the seed for our current adventure. 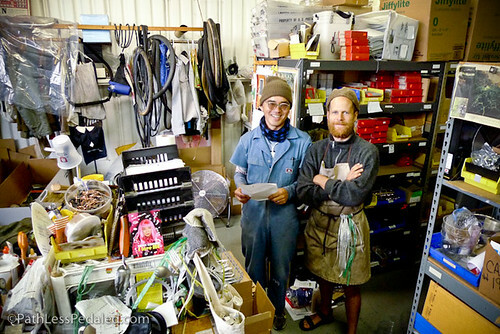 While there, we also got to meet other members of the Rivendell team like Vaughn and Robert who work in shipping. Their main responsibility is to make sure that all the wonderful things you order make it from Walnut Creek to your front doorstep. 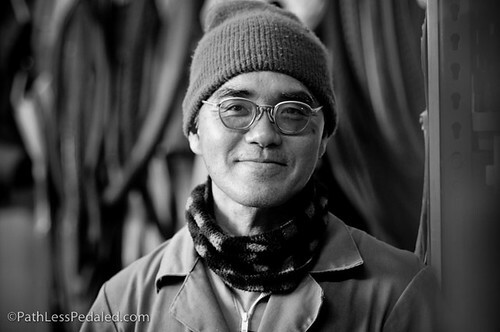 Everything from Nitto racks to Tagua nuts. 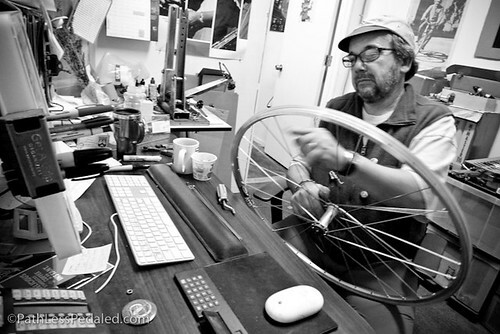 I also got a chance to talk a little with Rich – saxophone player and wheel builder. 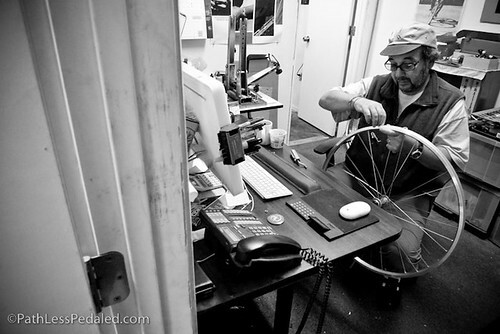 He’s the man who builds all the custom wheels for Rivendell (who also use to live in San Pedro, a few miles from Long Beach). He said he recently built his 4000th wheel. We left Rivendell when there was a break in the rain (Mark added spikes to our pedals while we were at lunch for a lot more traction!) to a motel down the road. It was a great experience to meet the people behind a company that has really inspired a lot of our adventures. That had to be rockin! 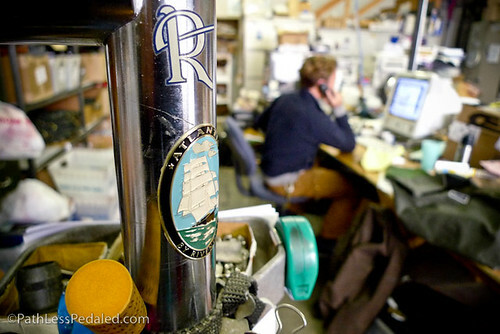 I would hope if I ever visited Riv Bike that I’d be able to contain myself or at least able to ask intelligent (but not too intelligent of course) questions. great post. 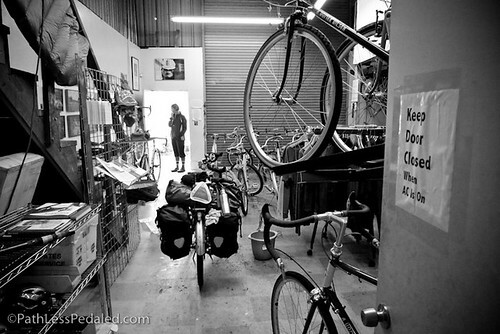 and great shots of the shop and its folks. Hey, isn’t that Pineapple Bob? Nice visit and commentary. Lived-in and simple just like you said. Glad to hear that the Berkeley Bowl is still there! I used to shop there a long time ago when I was at Cal. Hey Laura and Russ, we met you guys at a Greek restaurant in Anacortes. We were the cycle touring couple who was having bad luck with the new Thermarest Neoairs . . . traded them in for Big Agnes mattresses at REI when we got back to Eugene. We’ve been enjoying your travels and adventures. Pedal on! 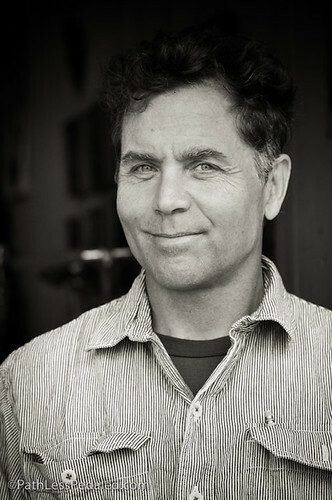 To be sure Grant Petersen has been an inspiration to many people; pushing back against the current racing bike mindset. Very cool post. sweet posting and pix. love the b&w’s especially. i will follow your travels with interest even though i don’t know you because YOU appreciate a place such as rivendell. as you have noticed, how could you not like such an atmosphere for a business? 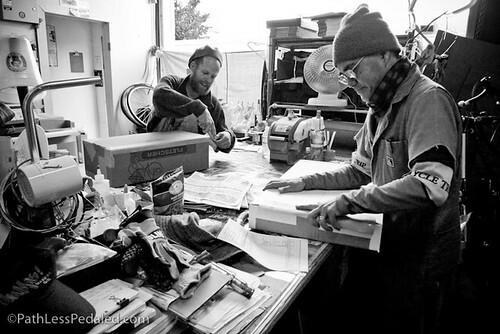 the guys, the bikes, the gear … well, it’s just such a great place. Thanks for this post. 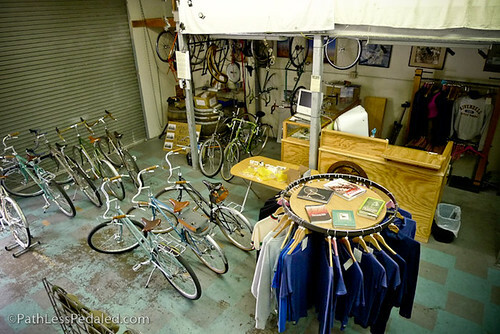 As an east coast guy, a visit to Grant and Riv Bike is a dream. It sure was great to read your story and look at your pics and imagine being there someday. You’ve also increased my resolve to set aside some money to purchase a Riv frame. Hey Russ and Laura! It looks like yall are having a great adventure! Nice post. Keep riding! I live states away so I haven’t been able to visit my son Vaughn at Riv yet. Your great posting will tide me over nicely until I can, however. Wonderful pix! V, you’re one handsome devil. Hi, this is Daniel; we met outside the Berkeley Bowl. Hope the directions to BART weren’t overly confusing, and hope the rest of your tour is amazing.